Week 3 of the Move Nourish Believe Challenge = BELIEVE. Such a great challenge. Is it bad that this was the hardest week for me? Maybe it’s because I’m a mom, a woman, a nurturer. But, this week we were supposed to focus a bit more on ourselves, and that was harder for me. Week 3 – Day One: Spoil Yourself! Monday was a busy day, and I kept thinking all day…what can I do to spoil myself? Most of the day my Mom and I were entertaining my Memaw, which didn’t leave a lot of room for spoiling. I guess if it counts I bought myself some cinnamon twists (licorice) at the Mennonite store in Tipton. 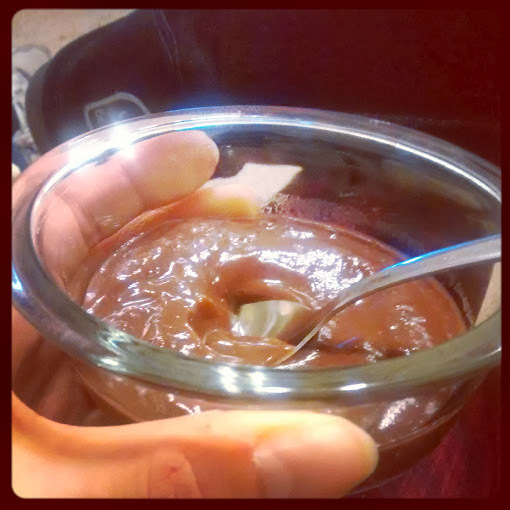 But, at the end of the night I made myself some pudding, put my feet up, and watched some Olympics. I felt like it was a pretty lame attempt at spoiling myself, but we can’t win them all, can we? My zen moment on Tuesday came when I was finally able to finish a Christmas (yes, you read that right) present for my brother. I wasn’t able to get it done in time for our gathering in December, but I had a secondary deadline that was Wednesday morning, and I believe we finished this around 11:30 Tuesday night. Just under the wire. 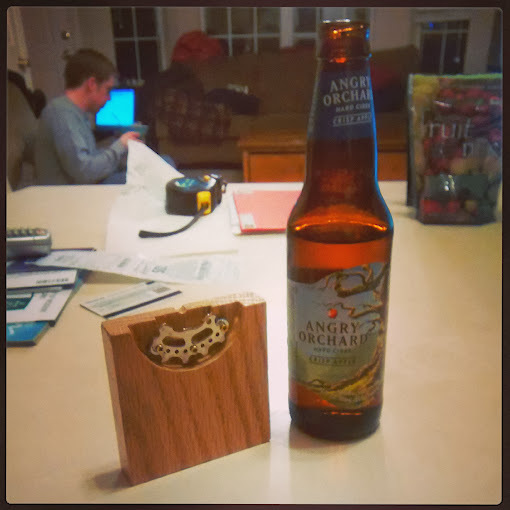 It’s a coaster, that’s also a bottle opener. Made from a sprocket that my husband was able to cut (which actually ended up being rather hard since sprockets are…well…extremely hard). Either way, we had to test it late that night to see if it really would open a bottle…and then I had to drink at least half of it. Can’t leave good hard cider to go to waste! I was inspired for this project from something I found on Pinterest, of course. Week 3 – Day Three: Be Happy! Show your Happy place! This was, hands down, the easiest part of the Challenge. I seriously have the sweetest little guy there ever was. 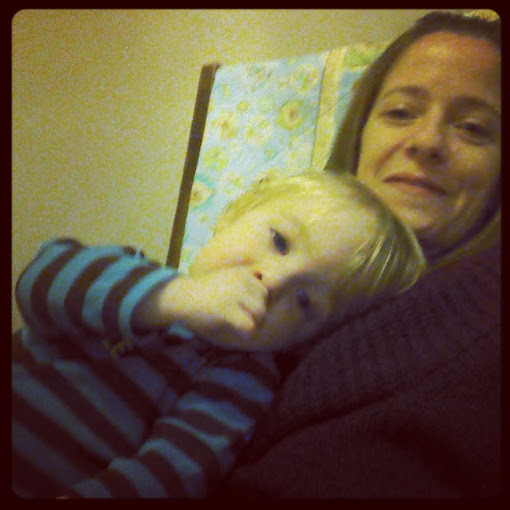 And he was a snuggler on Wednesday, which just made it that much better. Henry is my happy place. I have the smile wrinkles to prove it. 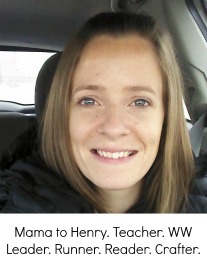 I’ve shared my Weight Watchers story before. But this week I’ve actually caught myself thinking about how long it’s been…and how I really have been successful at keeping 40 pounds off for…well, basically since 2010. So going on four years now. That’s, well, kinda crazy. I guess it doesn’t seem like that long since I’ve had a kid (and therefore gained and lost that weight again) during that time. But in a way, that makes it even cooler. 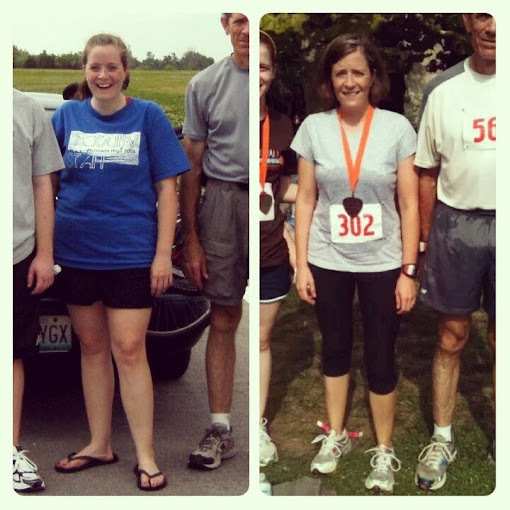 Left: Me during the Sedalia duathlon in the summer of 2008 (so, after I’d already joined Weight Watchers and lost some weight). This race was the first for my husband and I and it’s what really made us both realize how HORRIBLY out of shape we were. I won’t ever forget though, I did beat him. Ha. It’ll never happen again, but I did it once! Right: Me after finishing my second half-marathon. You might notice my dad is standing beside me in both pictures. Week 3 – Day Five: Share the love – S/O to your #1 supporter/motivator! 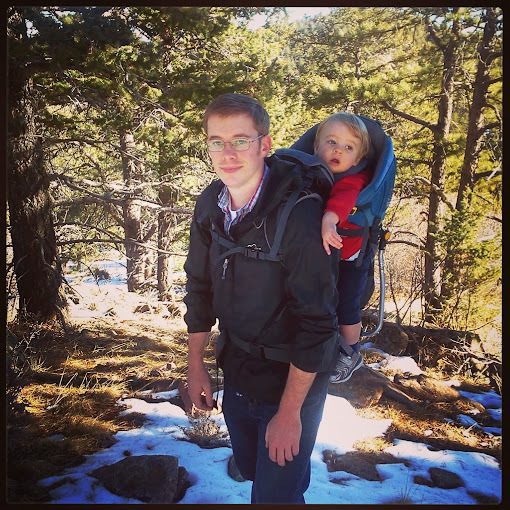 I had to dig around for a picture of both my guys (this one’s from our vacation to Colorado for Christmas this year). My husband’s not that big of a talker – anyone who knows him would probably agree with that – but he is definitely a good support system. He listens to my non-stop talking, lets me know when I’m crazy, lets me be a complete smartass most of the time, is SUCH a great dad to our little man, and is just in general pretty wonderful. This entry was posted in Uncategorized and tagged crafts, giving thanks, half marathon, healthy-living, lornajane, mnbchallenge, pinterest, sweatpink, weight watchers, WW. Bookmark the permalink.